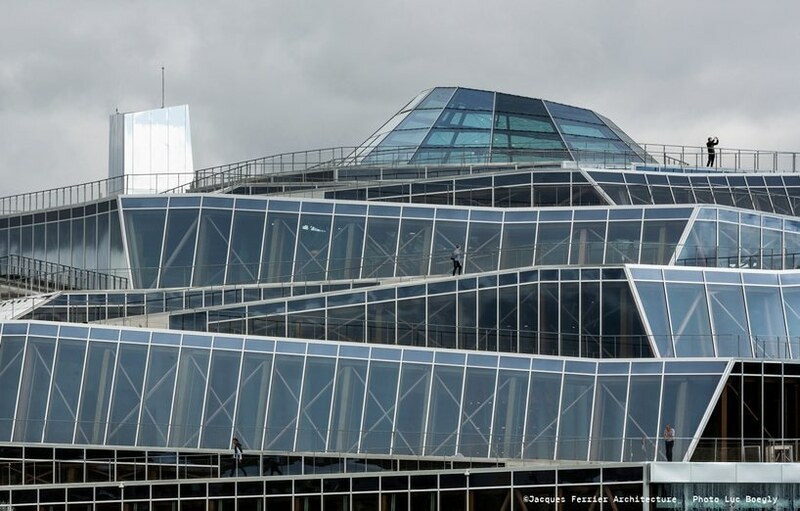 like an origami sculpture, jacques ferrier architecture’s ‘aqualagon water park’ in marne-la-vallée, france resembles an unfolding landscape, culminating at around 35 m: it is a built landscape, rising into the sky. 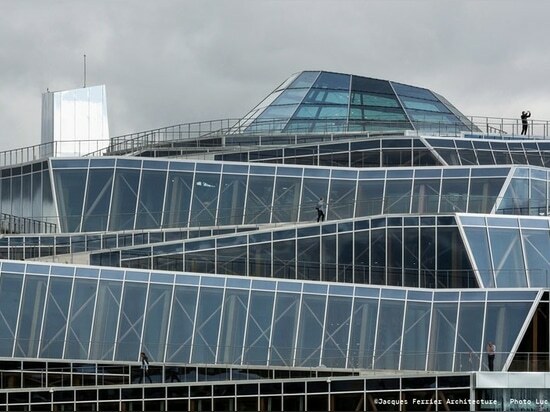 like an origami sculpture, jacques ferrier architecture’s ‘aqualagon water park’ in marne-la-vallée, france resembles an unfolding landscape, culminating at around 35 m: it is a built landscape, rising into the sky. the structure is clearly visible from the surrounding area — it becomes a point of reference and a symbol of villages nature. this new type of landmark contrasts with the relatively flat topography. it is not an element which has been imposed on the landscape, but an extension of the landscape itself. 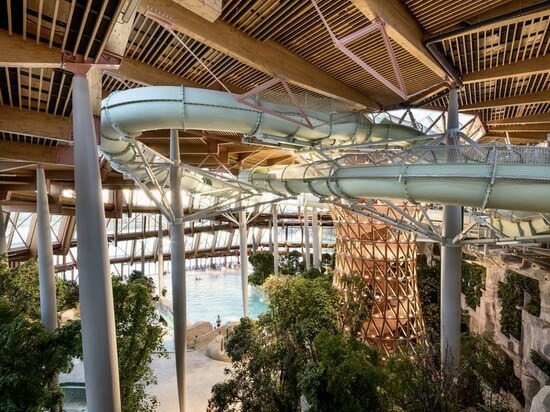 located by a large expanse of water, french based firm jacques ferrier architecture‘s aquatic park looks like a world that has emerged from the lake. it is an aerial construction, layering hanging gardens, playing with water and transparency. the terraces are open to walkers and are used to oxygenate the waters of the lake. the new landscape is composed of waterfalls, mist, steam and aquatic plants. the unique character of our proposal, which blurs the lines between landscape and built environment, creates a beacon, visible from all parts of villages nature. by day and by night, the aquatic park becomes a major icon of the site. 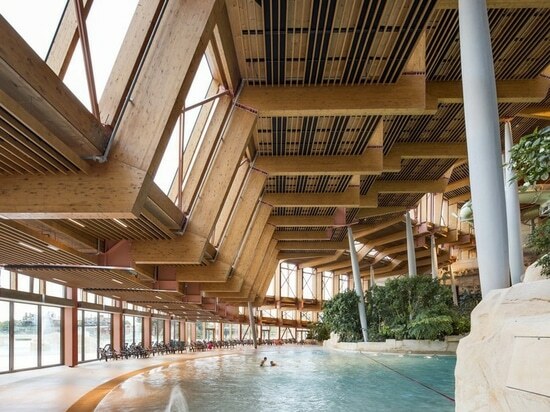 the origami structure is open to the public, it becomes an extension of the aquatic facilities: jacques ferrier’s proposal offers a new experience to visitors exploring this built landscape. 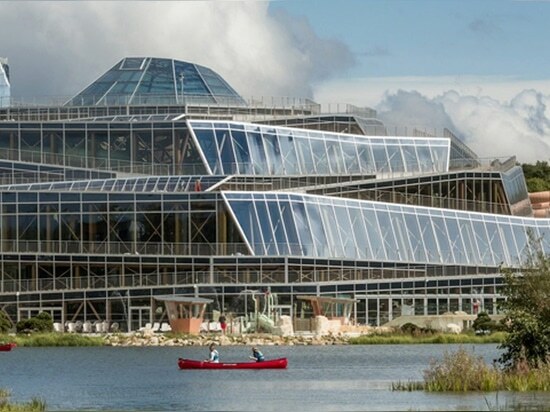 the structure presents a stunning vantage point over the inside of the aquatic park and offers spectacular views of villages nature and the wider landscape. 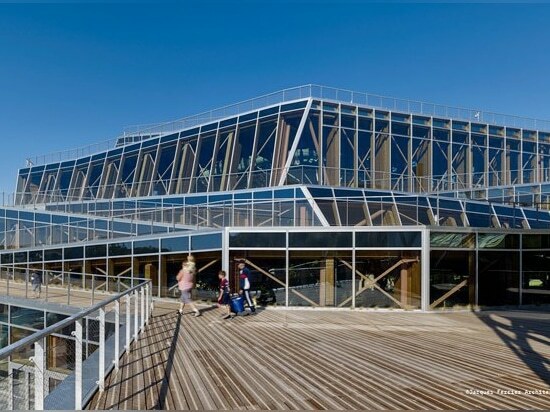 a circuit offers a walk surround the building, extending the board walk promenade. a lift offers the occasion to climb to the top of the walk to enjoy the view. as the origami unfolds, it creates empty spaces. 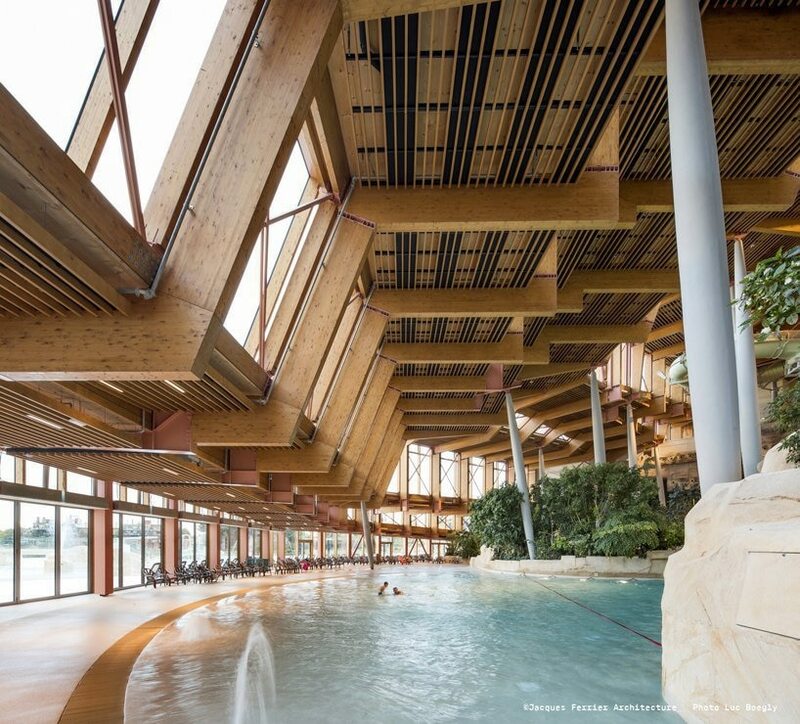 these spaces are filled by large glass panels that let natural light into the aquatic center and give visitors the sensation of a continuity between the interior and exterior. at the top of the building, a transparent dome with a remarkable geometry allows visitors to swim while watching the sky. this dome forms the silhouette of the aquatic park. 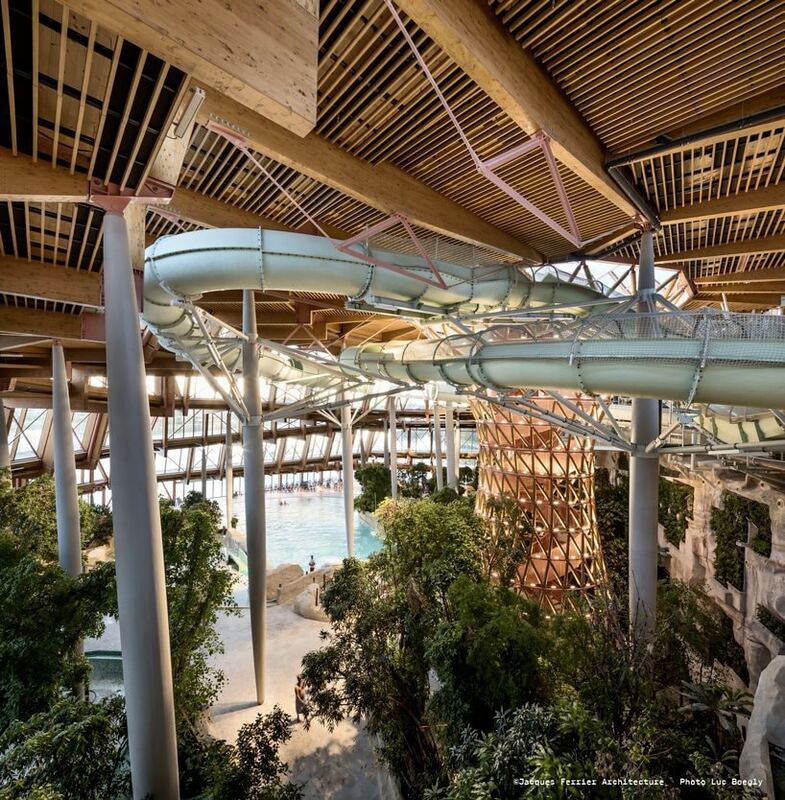 all the elements of the project participate in creating a sense of spectacle which serves to heighten the experience of the aquatic activities in the park. the remarkable ecosystem established by the planted terraces forms an instructive path. 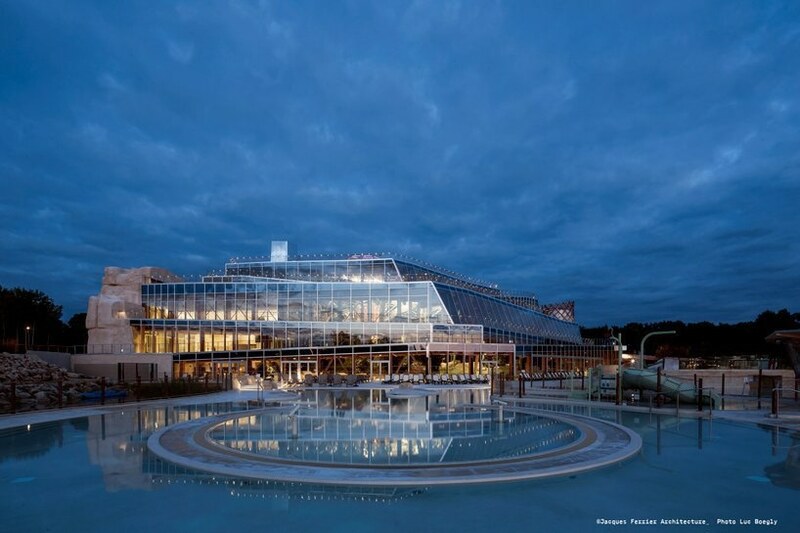 the various elements related to environmental sustainability — geothermal energy, water recycling — come together to form a coherent narrative that structures the entire project and can be clearly read by the public. the principle of the project, with its accumulation of levels, extends the aquatic park into sun-lounges, terraces and restaurants. these activities can easily be linked to seasonal variations in attendance. an auditorium barge arrives in the evenings and at various times of day to offer concerts and shows. the aquatic park forms an extraordinary backdrop for villages nature’s shows on the lake, fireworks displays and light shows. 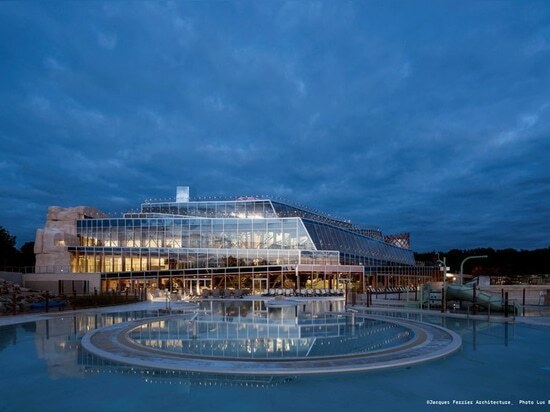 the entrance to the aquatic park is connected to a large forecourt around which villages nature’s different ‘public’ spaces are arranged: forum, sports center. the hall, which opens onto the lake, leads to changing rooms via a long corridor and servant spaces (machine room, storage, etc.). 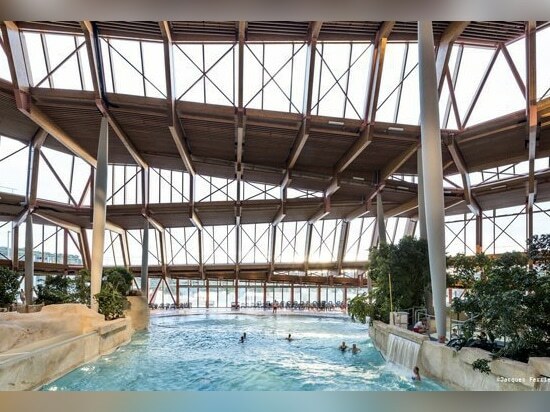 once visitors have gone through the changing room area, they discover the inner space of the aquatic park, designed as a large expanse of water strewn with islands of various sizes and with a variety of functions. this archipelago extends outside, into the lagoon, accentuating the continuity between indoors and outdoors. the air pavilion links the other two pavilions. it is set back from the edge of the lagoon to create a protected space.